Perfect for daycare centers and nursery schools, the Adventurer Infant Toddler Loft from Strictly for Kids encourages small children to development gross motor and social skills while having fun. Extra-deep steps, lower hand rail, fully sanded and rounded edges and a slide with safety barrier keep infants and toddlers safe. 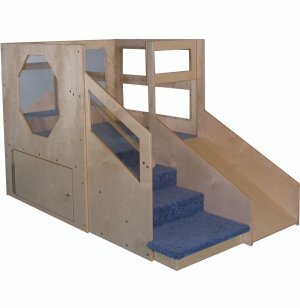 Loft area and stairs are fully carpeted and include a full mirror and unbreakable Lexan windows that let caregivers keep young ones in full view. Locking storage area is great for play equipment like balls and small ride-on toys. Baltic birch plywood construction provides beauty, strength and stability. 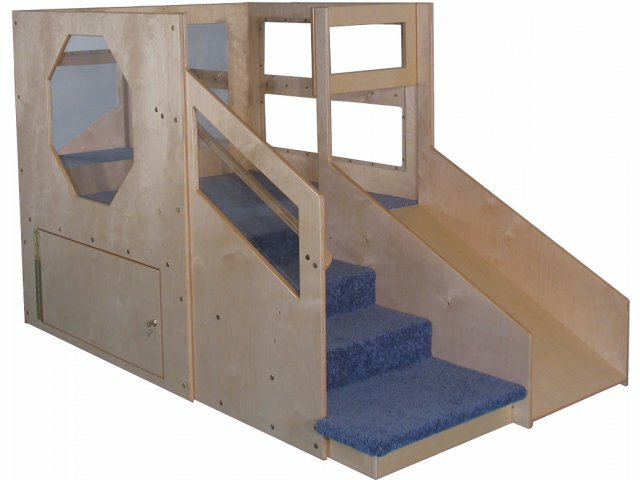 Safe: Extra-deep steps, lower handrail, fully sanded and rounded edges and safety barrier on slide keep little ones safe. Unbreakable: Lexan windows keep children within constant view and provide indestructible security. Convenient Storage: Locking storage compartment is perfect for a wide range of toys and equipment. Builds Gross-Motor Skills: Encourages infants and toddlers to explore while building gross-motor skills like crawling, climbing and balance. Facilitates Social Interaction: Encourages children to interact and practice turn-taking skills.